One of the continuing challenges in educator professional development is trust. Who validates educator learning experiences? How do you know the work submitted by your educators indicates particular competencies? In some PD systems, experts are in place to review the work before recognition is awarded, but this is not always scalable or equitable. 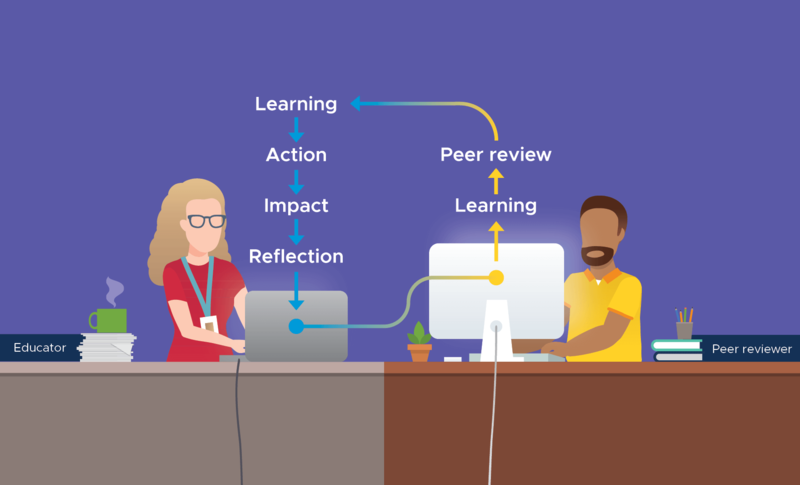 A peer review system is a simple way to build trust into your infrastructure, grant educators the power to drive their own learning, and ensure your team is building the knowledge, attitudes and skills outlined in competency frameworks. The process of reviewing a peer’s work is also a form of professional development. Teaching is, by design, a collective effort. The impact and overall effectiveness of an educator is a reflection of the support and feedback given for growth. By providing support through a peer mentor, there is an opportunity for both teachers and mentors to grow in their perspective fields. Every educator has the potential to be an effective leader, but not all school structures allow for this to be demonstrated. Empowerment comes not only from educators receiving critical feedback, but also through the reviewer building greater self-awareness. Not all teachers are given opportunities to lead in their own schools, and online Communities of Practice allow for that open exchange of feedback and ideas. Participate Certified Review empowers teachers as experts and places collaboration where it belongs—at the center of professional learning. Experienced educators are trained and work alongside their peers to offer feedback and support. The review process completes the full course cycle for teachers as they apply new concepts impacting their classroom practice, submit evidence of their learning, reflect on their experience and receive feedback from a trained peer reviewer before earning their micro-credential. Participate’s ultimate goal is to improve the experiences of teachers and to recognize and foster development of their expertise, classroom practices and impact on student learning. Interested in implementing peer review at your school district or organization?